"These are good people, hardworking people." Conservative Party of Canada leader Andrew Scheer speaks at his shadow cabinet meeting in Winnipeg on Sept. 6, 2017. 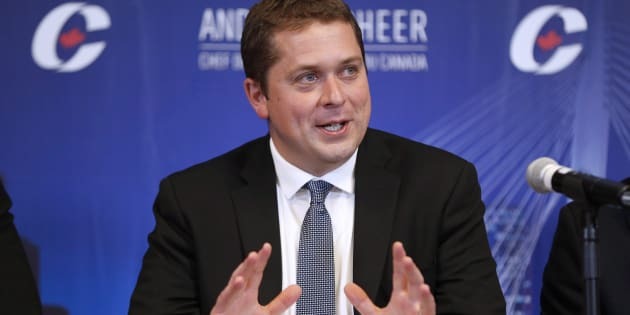 WINNIPEG — The federal Liberals are demonizing the country's small business owners to pay for their own out-of-control spending, Conservative Leader Andrew Scheer said Thursday. Scheer opened a two-day meeting of Conservative MPs and senators by hammering on the Liberal government's plan to end what it calls unfair tax advantages for the wealthy by changing elements of the tax code. Scheer says he has no doubt that the prime minister moves in circles where many people do try to avoid paying some measure of taxes, but the Tories are talking to the plumbers and ranchers trying to create jobs and save for their families. "These are good people, hardworking people, these are honest people who are being demonized by Justin Trudeau's Liberals just to pay for their out-of-control spending," Scheer said. The proposed changes to the tax code announced by the Liberals earlier this summer provided an unexpected political gift to the Conservatives, seeking new momentum in Opposition after Scheer was elected leader of the party in May. Dozens of groups have rallied against the changes and Trudeau got an earful at a town hall Wednesday night in Kelowna, B.C., where the Liberals are currently meeting. He defended the plan, saying there was nothing it that targets small, middle-class business. But he was also careful to emphasize there's nothing illegal about using the tax provisions the way they are written now. "There is no suggestion that you haven't been following the rules," he said. "There is a suggestion that perhaps the rules which benefit the wealthy deserve a little tweaking and that's exactly what we're doing." Scheer told caucus the subject will top of mind when Parliament resumes this fall, as the Opposition seeks to press the government on other hot button issues from the summer. Conservative Party of Canada leader Andrew Scheer speaks, as Lisa Raitt and Alain Rayes listen in, at his shadow cabinet meeting in Winnipeg on Sept. 6, 2017. Among them — the situation of asylum seekers at the Canadian border and the $10.5 million settlement with Omar Khadr, the Canadian accused of killing a U.S. medic and wounding another during a fire fight in Afghanistan. Cries of "shame, shame" greeted Scheer as he denounced the settlement, made to end a civil lawsuit Khadr filed against the government for violating his rights when he was interrogated at Guantanamo Bay. But Scheer has other issues on the burner, including ensuring his caucus remains united in the wake of a heated leadership contest he won only by a fraction of the vote in the 13th round of balloting. Failed candidate Brad Trost is trying to take the party to court, arguing the way it handled an alleged leak of the membership list by his campaign was unfair. Trost said he doesn't feel the lawsuit is a source of discord among MPs and said Scheer's office has also been helpful in trying to get the party to release information and documents on the issue that it had previously withheld. Trost was one of two sitting MPs who ran in the leadership race who aren't part of Scheer's "shadow cabinet," the roster charged with keeping track of the government's various ministries. The other was Kellie Leitch, who did not appear to be at the Winnipeg gathering.